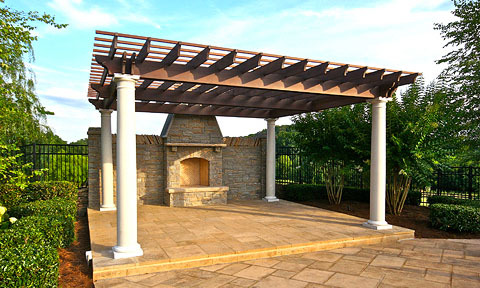 This large pergola, with 17-foot spans, beautifully frames an outdoor fireplace area. The 12" columns are painted white, while the upper structure has been stained a rich pecan color to contrast with the columns. 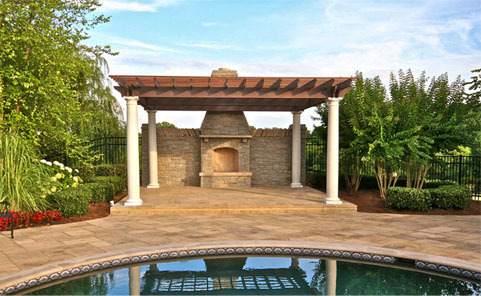 Working closely with our client, a very clean and elegantly simple pergola design was established. Five double main beams were incorporated to create a support structure for the smaller rafters.